Quilts made by hand on the Isle of Skye. 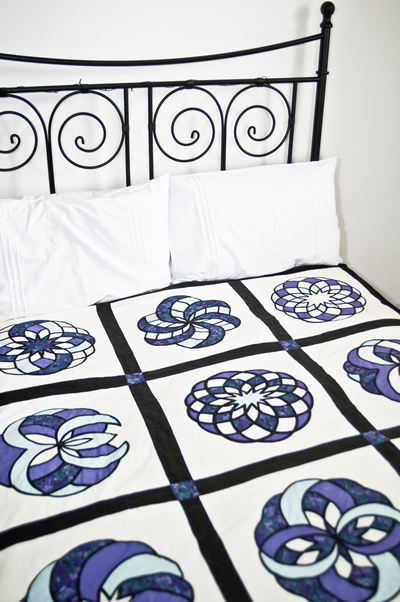 A hand-crafted quilt is the perfect gift to express love, bring comfort and encapsulate memories. From cot quilts, to children's quilts, to wedding quilts, the Wee Quilter designs and creates quilts for every occasion. Drawing from the influences of her own Scottish roots, as well as traditional American patchwork and quilting methods, the Wee Quilter welcomes commissions from all over the world—whether inspired by some of her existing designs or the challenge of a new, bespoke idea. If you envision something in quilt form—the Wee Quilter will work to bring it to life. The Wee Quilter Studio is open for visitors Monday - Friday, 10:30 am-5:00 pm, from Easter to October every year. Come and take a look at some ready-made quilt designs, wall hangings, cushions and other quilted gifts in stock at the studio shop, or chat to the Wee Quilter about commissioning a custom order. You'll find the Wee Quilter Studio in Staffin—northeast on the Isle of Skye, and set against the stunning backdrop of the Trotternish Ridge—famous for its mountain rock formations 'the Quiraing' and 'Storr'. Contact the Wee Quilter directly to request a commission, or visit the Wee Quilter Facebook page for regular updates on items which have been made, and are ready to sell. For more than 20 years Wendy Higgins, a.k.a: the Wee Quilter, has been passionately quilting; developing her craft at workshops and quilt groups; displaying at trade shows; tutoring novice quilters and travelling as far as Kentucky, Pennsylvania and New England to hone her skills. She has a particular interest in traditional and Amish quilting. Wendy works and sells from her studio on the Isle of Skye, as well as selling through local shops and outlets, at craft fairs and online.